This Colts fan gets it done on Saturday. Sometimes, you just have to give credit for ingenuity. A group of Chiefs fans traveled to Indy for Saturday’s AFC wild-card game against the Colts. Now, those are some real fans right there. And they decided to get together a take a group photo to commemorate the day. Understandable, right? 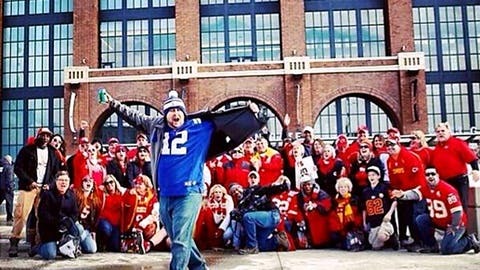 That’s when one rogue Colts fans, wearing an Andrew Luck jersey, pulled off an epic photobomb. The funny part of this is seeing the reaction of everyone in the background. There are looks of surprise, and of course, some laughter. Even the NFL had to give credit where it’s due.